So this is it – tomorrow is our big departure day. 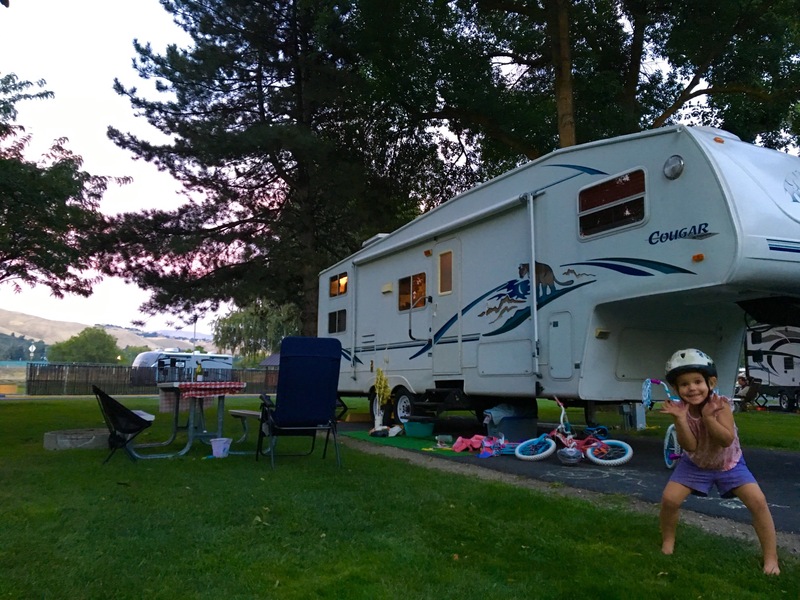 We’ve been living in our camper for a week now, but just 5 minutes outside of our hometown – we’ve been finishing up last minute errands, goodbyes, and Amazon orders. We will check out of this campground at noon tomorrow and meet a few friends just outside the park who have graciously offered to send us off with some hugs, prayers for safety, and maybe even some anointing oil for Stumbo. The whirlwind of the last few weeks – packing out of our house and into this one, selling both cars, endless to-do lists that never seem to get completed – has my head still spinning (and also not laying on its pillow at the correct hours). So as people have repeatedly asked me this week how I’m feeling about our departure, the only honest answer is….tired. Part of that is the flurry of activity in recent days. But part of it I think is also because the thing that I’ve been most excited for and fearful of for the past 6 months is finally here, and there’s no more time before departure to anticipate a need, to research the gear, to get accounts in order -nothing left to do except to go. When we fully committed to this idea around April of this year, I became familiar with a new sensation…a new fear that because this adventure was something I desired so much that something was going to happen to keep it from being possible. I thought I had skin cancer. I thought Brad might have a heart condition. I kept ALMOST getting into car accidents. I thought there was no health insurance option for us that would cover us outside of Washington State. There were so many little things that kept popping up – like they always do in all of life – but at this stage they all felt like they would be the end of our next step. Ear infections made me fear chronic sinus issues. Needing new truck tires made me fear financial ruin. A trip to the ER (our 1st EVER in Wenatchee) for an allergic reaction Brad had caused us both to consider whether or not I would take the girls on this trip if he died. Two days before we moved out of our house we saw ants in our kitchen for the first time ever…ANTS?!….REALLY?! Can you tell we’ve been a bit high-strung lately?! I can laugh at these ridiculous worries now as I type them, but they have all been legitimate fears that have cost me emotional energy over the last few months. What that has looked like for me the past few months, is I’ve tempered my vulnerability by focusing on all of the things that might happen to take this joy away from me. I’ve also found myself saying over and over this week, “I know this (some part of life in the RV) will get old eventually, but right now it’s so fun!” I know that I am just preparing myself for joy over these things to fade, but in diminishing the opportunity for disappointment to surprise me later, I’m also diminishing my own joy in that moment. So tomorrow at noon, I’m going to try really hard to release the foreboding joy in my stomach that something will go wrong and to lean into the joy that this adventure that we’ve been preparing for for so long is finally here. Ok, tribe. Lean into your joy. You bet – thanks for reading! Sarah, your words always make my own reality more vibrant to me. I’d call that good writing. Cheers to leaning in! Thanks – what a compliment!